I’m hoping that someone who is reading this has a solution to my problem. I have a "non-brand-name" mimosa tree that came for free with my house and land. I bought it last year, but I was afraid to ask the owners how old the mimosa was. 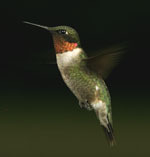 The blooms are pink and last for nearly two months between mid-May and mid-July and draw lots of hummingbirds. 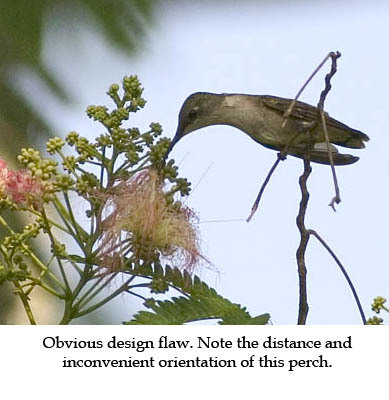 However, based on some reading I did on some Usenet, Yahoo and other miscellaneous groups and mailing lists, I am concerned that my off-brand mimosa might not be attracting as many hummingbirds as possible and, perhaps worse, might actually be a *bad idea* or even hazardous for hummingbirds! First, it has very few perches near the feeding ports. I’ve gleaned from my research that if it had more and better placed perches, the hummingbirds would literally flock to it, practically tripling the meager swarm that inhabited the tree this year. 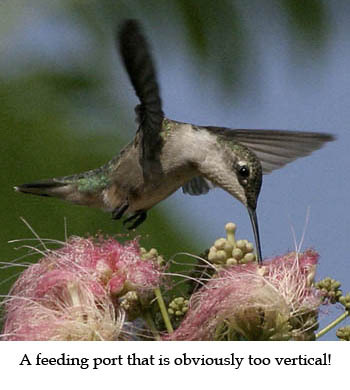 Next, what few perches it has appear to be too far from the feeding ports for the average hummingbirds. Some say that hummingbirds are creatures of habit and eat from off-brand mimosas simply because they are widely available and inexpensive but, if given the choice, would prefer one of the better-designed, brand-name varieties of mimosa. This makes a lot of sense because I know plenty of people who prefer brand-name things to regular, no-brand or cheap brand stuff. That my mimosa is poorly designed is quite obvious. After just a little usenet reading I realized that the blooms are far too vertical to allow the safe removal of nectar by the hummingbird without injury. The blooms are so vertical that the bird in the photo at right might have injured his neck and died right after this photo was taken. In fact, I believe that the fact that I didn’t actually see him die, or find his body, is irrefutable evidence that he died and was quickly eaten by some creature that eats hummingbird corpses like a skink, gecko or praying mantis. Not satisfied that my mimosa was effective and safe, something you just can’t tell by watching 20 or so hummingbirds swarm around it, I have resigned myself to the fact that I will have to cut it down for the sake of hummingbird safety. I am also ashamed to admit that the nectar in the mimosa may not be a perfect 4:1 ratio and sometimes the blooms last more than a few days without any apparent nectar changing. I’m sad to say, all the defects that I have already mentioned pale in comparison to the number of bees that my mimosa tree attracts! Since my off-brand mimosa doesn’t have bee guards, and since even the smallest amount of any oil or repellant is known to kill hummingbirds on contact, without any evidence of their bodies being left behind (thanks to the hummingbird-corpse eating animals mentioned above), I am at my wit’s end on how to prevent bees and other flying insects from invading the hummingbirds’ space. What’s worse is that the hummingbirds don’t even seem to recognize all these dangers. They just keep swarming around my tree, sipping nectar and chasing each other around without any regard to the perils lurking all around them! Does anyone have any recommendation for a better-designed, name-brand mimosa that I can plant in my yard? Any guidance will be deeply appreciated. © Copyright 2005 Eric J. Miller. All Rights Reserved.